Hydrochemical investigation of open well and river water samples of Thuthapuzha Sub-basin of Bharathapuzha, Kerala, was carried out to determine the spatial and temporal variations in the physico-chemical parameters. The suitability of water for drinking and irrigation purposes and the processes controlling the water chemistry were also assessed. The study area experiences a humid tropical climate and heavy rainfall of ~ 3830 mm/year. Thirty-five open well and nine river water samples were collected during the pre-monsoon, monsoon and post-monsoon seasons. The chemical properties of the river water samples were dominated by alkaline earths and weak acids (CaHCO3 type). Even though majority of the open well samples belonged to CaHCO3 type, few samples belonged to NaCl, mixed CaMgCl and mixed CaNaHCO3 water type. The groundwater and river water chemistry of the region was influenced by the chemistry of the host rock rather than precipitation and evaporation. Except pH and the total iron concentration, all other physico-chemical parameters of the open well samples of the study area were within the acceptable limit of drinking purposes. The physico-chemical parameters of the entire river water samples were within the acceptable limit for drinking purpose. The entire open well and river water samples were suitable for irrigation purposes. Geometric increase in population coupled with rapid urbanization, industrialization and agricultural development has resulted in high impact on quality and quantity of water in India. Hence, the availability and the quality of the freshwater resources are the most pressing of the many environmental challenges in India (CPCB 2011). The quality of water is of vital concern for mankind, since it is directly linked with human welfare. Poor quality of water adversely affects the plant growth and human health (WHO 1984; Hem 1985). A number of studies on water quality have been carried out in different parts of India (Sreedevi 2004; Semwal and Akolkar 2006; CPCB 2011; Thilagavathi et al. 2012; Brinda et al. 2014; Balwant et al. 2016). All these studies reveal that both rivers and groundwater in India are facing water quality issues. The state of Kerala, located in the south-western corner of India, is blessed with 44 rivers and heavy rainfall of ~ 3000 mm/year. However, most of the water in the rivers is quickly drained into the Arabian Sea due to the steep seaward sloping of the state. Hence, in addition to rivers, the groundwater is also utilized to meet the water requirements of the state. The increase in population, development activities, urbanization, change in land-use pattern, etc. has created a concern among the people of Kerala regarding both the river water and groundwater quality of various river basins. Several studies were attempted earlier to address the water quality of various rivers of Kerala. Nandan (2007), Jalal and Kumar (2013) and Maya et al. (2013) and Anitha et al. (2014) assessed the water quality of Periyar, Pampa, Neyyar and Chaliyar rivers, respectively. The effects of pollutants on the physico-chemical characters and nutrient load of river Kalpathipuzha, Palakkad, were studied by Divya and Manomani (2013). A comparison of water quality index (WQI) between Peruvanthanam and Valiyathodu sub-watersheds was carried out by Rekha et al. (2013). The water quality of both river and groundwater of various river basins of Kerala was assessed by CWRDM (2009; 2017), groundwater of Karakulam Grama Panchayat (Jaya and Deepthi 2015), Kazhakuttam block (Binoj Kumar and Divya 2012) of Thiruvananthapuram district, coast of Ernakulam district by Sreekesh et al. (2018), etc. Bharathapuzha River Basin, the second-longest (209 km) and the second-largest river basin of Kerala (4400 km2), is the lifeline of approximately four million people residing in three administrative districts, namely Malappuram, Trissur and Palakkad districts of Kerala. The river originates from different parts of the Western Ghats, as small brooks and rivulets which later join and form four major tributaries, namely Kalpathipuzha, Gayathripuzha, Thuthapuzha and Chitturpuzha (Nikhil Raj and Azeez 2010). Bharathapuzha drains with an average annual discharge of 3.94 km3 of which approximately 42% (1.6 km3) is contributed by Thuthapuzha (Nikhil Raj and Azeez 2009). Numerous studies have been carried out in Bharathapuzha River Basin on various aspects. 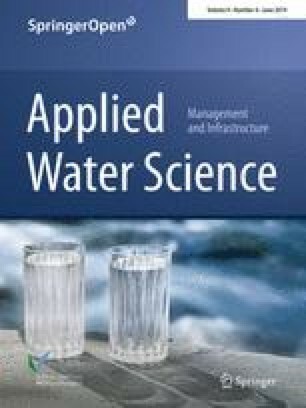 The water availability and the status of water demands in the basin were addressed by Dinesan et al. (2004). Brijesh (2006) evaluated the groundwater conditions and developed a groundwater model for the basin. The groundwater quality issues in the shallow aquifers of Palakkad and Chittur taluks of the basin was addressed by Kannan and Sabu Joseph (2010). The present study aims to determine the spatial and temporal variations in the physico-chemical parameters of both open well and river water samples of Thuthapuzha Sub-basin of Bharathapuzha. The suitability of water for domestic and irrigation purpose and the hydrochemical processes that control the chemistry of water in this area were also assessed. Thuthapuzha Sub-basin (10°50′–11°15′ north and 76° 05′–76°40′ east), located within the Palakkad and Malappuram districts of Kerala, is a sixth-order sub-basin of Bharathapuzha covering an area of ~ 1018 km2 (Unnikrishnan Warrier and Manjula 2014). Thuthapuzha is about 63 km in length and has four tributaries draining to it, namely Kuntipuzha, Nellipuzha, Kanhirapuzha and Thuppanadpuzha (Fig. 1). The average annual discharge of the sub-basin is 1750 MCM (CWC 2012). The study area falls within the midland (7.5–75 m elevation above mean sea level) and the highlands (> 75 m elevation above mean sea level) region of Kerala and experiences a humid tropical climate. The Silent Valley Reserve Forest is located at the north-eastern corner of the sub-basin. The average annual rainfall in Thuthapuzha Sub-basin is 3830 mm (Manjula 2015). This is higher than the average annual rainfall (1822 mm) of entire Bharathapuzha River Basin (Nikhil Raj and Azeez 2012) and the average annual rainfall (2817 mm) of Kerala state (Krishnakumar et al. 2009). The rainfall is dependent on the south-west and north-east monsoons which contributes 63% and 23%, respectively, of the total annual rainfall. The pre-monsoon showers also contribute 13% of the total annual rainfall. Wide spatial variation in the rainfall ranging from 2020 mm to more than 5000 mm/year is observed, and the high rainfall is towards the Silent Valley Reserve Forest (Manjula 2015). The study area is underlain by Precambrian crystalline rocks like charnockite, charnockitic gneiss, hornblende biotite gneiss, garnet biotite gneiss, khondalites, migmatites, etc. (Ravindrakumar and Chacko 1994). A gabbro dyke traverses extensive lengths of the study area (CGWB 2009). Laterite capping is observed over the major part of the study area with a maximum thickness of 20 m along the western part. Laterite is either absent or observed as thin capping over the country rock towards the eastern part. Thirty-five open well samples and nine river water samples of Thuthapuzha Sub-basin were collected using 1L depth water sampler. The samples were collected (Fig. 1) in 1-L capacity plastic containers for the physico-chemical analyses during the pre-monsoon, monsoon and post-monsoon seasons. The water samples were analysed following the standard analytical procedures and techniques reported in the literature (APHA 1995). The physico-chemical parameters like pH and electrical conductivity were measured in the field itself using water analyser kit (Horiba U10). Sodium and potassium present in the water samples were determined by the flame photometric method, calcium by the EDTA titrimetric method and iron by phenanthroline method. Magnesium was determined indirectly from the total hardness and the calcium hardness value. Chloride and sulphate were estimated by argentometric method and turbidity method, respectively, and the nitrate using an Ion selective electrode. Colorimetric method and stannous chloride method using a spectrophotometer were employed to determine the fluoride and phosphate in water samples. Bicarbonate present in the water samples was calculated from the measured total alkalinity values which were estimated by titration against a standard acid. All the analyses were carried out in the laboratory housed at Centre for Water Resources Development and Management, Kozhikode. The summary of the physico-chemical analyses of the water samples is presented in Table 1. The desirable limit of pH of water for drinking purpose prescribed by Bureau of Indian Standards (BIS 2012) is 6.5–8.5. A low pH of below 6.5 can cause corrosion to metal pipes (Trivedy and Goel 1986) and gastrointestinal disorders (Rajesh et al. 2001). The pH of the open well samples varied from 4.60 to 7.00 during the pre-monsoon season, 4.70 to 7.00 during the monsoon season and 4.30 to 6.70 during the post-monsoon season. The pH of 77%, 66% and 71% of the open well samples during pre-monsoon, monsoon and post-monsoon seasons, respectively, was below the prescribed limit (< 6.5) for drinking purposes (BIS 2012). Since laterites have the capacity to generate acidity and consume majority of all dissolved oxygen in the water that infiltrates into the earth system (CESS 1984), the low pH of the open well samples of the study area may be attributed to the laterites and lateritic soil. In contrast to the open well samples which were mostly acidic, the river water samples were neutral to slightly alkaline with average pH value of 7.34, 7.31 and 7.30 during the pre-monsoon, monsoon and post-monsoon seasons and were within the prescribed limit for drinking purpose. Electrical conductivity (EC) is the measure of concentration of electrolyte in water in the form of ions (Weast 1968). The electrical conductivity provides a proxy for the hydrochemistry of the study area. The electrical conductivity of the open well samples of the study area ranged from 30.00 to 350.00 μS/cm during the pre-monsoon season, 20.00 μS/cm to 430.00 μS/cm during the monsoon season and 20.00 μS/cm to 450.00 μS/cm during the post-monsoon season. The seasonal average of electrical conductivity during the pre-monsoon, monsoon and post-monsoon seasons was 156.74 μS/cm, 150.97 μS/cm and 156.51 μS/cm, respectively. The seasonal average of electrical conductivity of the river water samples was lower than that of open well samples and was 65.11 μS/cm during the pre-monsoon, 49.55 μS/cm during the monsoon and 55.00 μS/cm during the post-monsoon season. The electrical conductivity of the river water increased towards the downstream direction in all the three seasons which may be due to groundwater contribution in the lower reaches of the river. Total dissolved solids (TDS) comprise inorganic salts and small amounts of organic matter that are dissolved in water (WHO 1993). The seasonal average of TDS of open well samples during the pre-monsoon, monsoon and post-monsoon seasons was 92.89 mg/L, 90.57 mg/L and 93.90 mg/L, respectively. The seasonal average of TDS of river water samples was 39.13 mg/L during the pre-monsoon season, 29.47 mg/L during the monsoon season and 32.93 mg/L during the post-monsoon season which were considerably lower than the open well samples. Water resources with TDS values less than 300 mg/L are considered as excellent, 300–600 mg/L are good, 600–900 mg/L are fair, 900–1200 mg/L are poor and greater than 1200 mg/L are unacceptable for drinking purpose (WHO 1984). The TDS of the entire open well and river water samples of the study area were less than 300 mg/L and excellent for drinking purpose. The main source of sodium (Na) in water is plagioclase feldspars, feldspathoids and clay minerals (Hem 1985). The seasonal average of Na concentration of open well samples was 13.17 mg/L, 12.26 mg/L and 13.13 mg/L during the pre-monsoon, monsoon and post-monsoon seasons, respectively. The seasonal average of Na concentration of the river water samples was 5.31 mg/L, 3.44 mg/L and 4.17 mg/L during the pre-monsoon, monsoon and post-monsoon seasons, respectively, which were lower than the Na concentration of the open well samples. The maximum permissible limit of Na in drinking water is 200.00 mg/L (WHO 1984). Irrespective of seasons, the entire river water and open well samples were within the highest permissible limit for drinking purpose. Even though potassium is found extensively in rocks, its concentration in natural waters is usually low because of the resistance offered by potassium minerals to weathering and dissolution (Hem 1985). The concentration of K in the open well samples ranged from 0.10 to 14.20 mg/L during the pre-monsoon season, 0.70 mg/L to 18.40 mg/L during the monsoon season and 0.90 mg/L to 15.10 mg/L during the post-monsoon season. The seasonal average of K concentration of the river water samples during the pre-monsoon, monsoon and post-monsoon seasons was 1.56 mg/L, 1.46 mg/L and 1.42 mg/L, respectively. The calcium (Ca) concentration of open well samples exhibited spatial and temporal variations. The seasonal average of Ca concentration of open well samples was 14.20 mg/L, 9.13 mg/L and 10.15 mg/L during the pre-monsoon, monsoon and post-monsoon seasons, respectively. The seasonal average of Ca concentration of the river water samples during the pre-monsoon, monsoon and post-monsoon seasons was 7.88 mg/L, 4.86 mg/L and 6.23 mg/L, respectively. The calcium concentration of the entire open well and river water samples was less than 75.00 mg/L during all the three seasons and was within the highest desirable limit prescribed by BIS (2012) for drinking purposes. The main source of magnesium (Mg) in water is the igneous rocks containing ferromagnesian minerals like olivine, pyroxenes, amphiboles and various dark-coloured micas (Hem 1985). Magnesium content of open well samples ranged from 0.49 to 8.40 mg/L during pre-monsoon, 0.35 mg/L to 16.50 mg/L during the monsoon and 0.49 mg/L to 14.09 mg/L during the post-monsoon season. The Mg concentration of the river water samples showed a minimum value of 1.46 mg/L during the pre-monsoon and 0.49 mg/L during both the monsoon and post-monsoon seasons. The maximum values were 5.35 mg/L, 2.92 mg/L and 3.89 mg/L during the pre-monsoon, monsoon and post-monsoon seasons, respectively. The Mg concentration of the entire open well and river water samples was less than 30.00 mg/L in all the three seasons and was within the acceptable limit for drinking purposes prescribed by BIS (2012). Although iron is the second most abundant metallic element in the earth’s outer crust, concentrations present in water generally are small. If present in water in excessive amounts, it forms red oxyhydroxide precipitates that stain laundry and plumbing fixtures (Hem 1985). 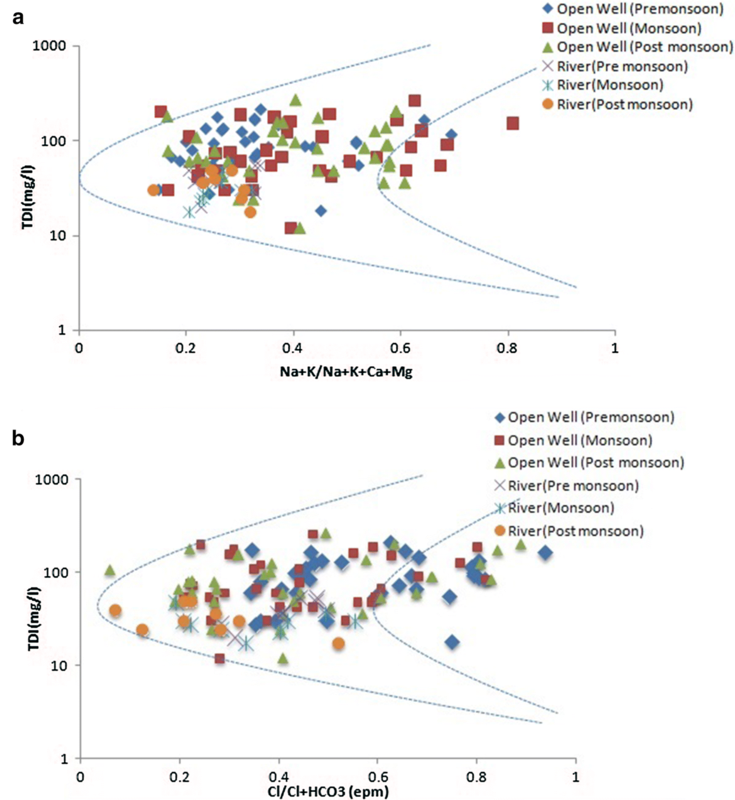 The seasonal minimum total iron concentration of both open well and river water samples was below the detectable limit (BDL) irrespective of seasons. For the open well samples, the seasonal maximum values were 0.52 mg/L, 0.90 mg/L and 0.46 mg/L during the pre-monsoon, monsoon and post-monsoon seasons, respectively. The seasonal maximum values of river water samples were 0.12 mg/L during the pre-monsoon and 0.10 mg/L during both the monsoon and post-monsoon seasons. Recommended upper limit for iron in drinking water was 0.3 mg/L (BIS 2012). The total iron concentration of 97%, 94% and 91% of the open well samples during the pre-monsoon, monsoon and post-monsoon seasons, respectively, was within the acceptable limit for drinking purpose prescribed by BIS (2012). The entire river water samples irrespective of the seasons were within the acceptable limit for drinking purpose. Atmospheric deposition of oceanic aerosols and weathering of rock salts are the natural sources of Cl in water, whereas the anthropogenic sources include industrial or domestic sewage effluents and run-off from agricultural fields through fertilizers (Chattopadhyay et al. 2005). The chloride concentration of the water samples of the study area belonged to three classes, namely very oligohaline (< 5 mg/L), oligohaline (5–30 mg/L) and fresh (30–150 mg/L) (Stuyfzand 1989). 3% of open well samples during the pre-monsoon and 9% during both monsoon and post-monsoon seasons belonged to the ‘very oligohaline’ class. 83%, 80% and 77% of the open well samples were ‘oligohaline’ and 14%, 11% and 14% of the open well samples belonged to the ‘fresh’ category during the pre-monsoon, monsoon and post-monsoon seasons, respectively. 33%, 22% and 56% of river water samples during the pre-monsoon, monsoon and post-monsoon seasons belonged to the ‘very oligohaline’, and 67%, 78% and 44% of the river water samples belonged to the ‘oligohaline’ category. 100% of the open well and river water samples during all the three seasons were within the desirable limit (250 mg/L) for drinking purpose. The primary source of bicarbonate in natural water is the dissolved CO2 in rain water (Karanth 1989). The seasonal average of HCO3 concentration of open well samples during the pre-monsoon, monsoon and post-monsoon seasons was 23.51 mg/L, 34.83 mg/L and 36.79 mg/L, respectively. For the rivers, the seasonal average of bicarbonate concentration was 13.53 mg/L during the pre-monsoon, 21.10 mg/L during the monsoon and 26.11 mg/L during the post-monsoon season. In natural waters, the sulphate (SO4) generally occurs as soluble salts of calcium, magnesium and sodium (NAS 1977). The seasonal average of SO4 concentration of the open well samples was 2.86 mg/L during both pre-monsoon and post-monsoon seasons and 2.05 mg/L during the monsoon season. For the river water samples, the seasonal average of SO4 concentration was 2.42 mg/L, 1.43 mg/L and 1.15 mg/L during the pre-monsoon, monsoon and post-monsoon seasons, respectively. The SO4 concentration of entire open well and river water samples irrespective of seasons was within the acceptable limit (< 200 mg/L) for drinking purpose prescribed by BIS (2012). Igneous rocks, plant and animal debris are the natural sources of nitrate to water (Chattopadhyay et al. 2005). Anthropogenic sources include seepage from septic tanks, the application of sewage and sludge to the land (Waller 1988). The seasonal average of NO3 concentration of the open well samples was 4.43 mg/L, 1.51 mg/L and 1.49 mg/L, and for the river water samples, it was 0.94 mg/L, 0.32 mg/L and 0.35 mg/L during the pre-monsoon, monsoon and the post-monsoon seasons, respectively. The NO3 values of the entire open well and river water samples during all the three seasons were within the acceptable limits (45 mg/L) prescribed by the BIS (2012) for drinking purposes. The main source of F in water is minerals like fluorite, apatite, amphiboles like hornblende, certain micas, cryolite and ralstonite (Hem 1985). F is among the substances for which there are both lower (0.6 mg/L) and upper (1.2 mg/L) limits of concentration in drinking water, with identified health effect and benefits for human beings (ISI 1983). Very low doses of fluoride (< 0.6 mg/L) in water promote dental caries (tooth decay). However, when consumed in higher doses (> 1.50 mg/L), it leads to dental fluorosis or mottled enamel (WHO 1984). The F concentration of 20%, 43% and 40% of the open well samples during the pre-monsoon, monsoon and post-monsoon seasons was below the detectable limit of the instrument. All the open well samples were having F concentration less than 0.60 mg/L irrespective of seasons. This is in contrast to the high fluoride concentration (> 1.5 mg/L) in the open wells and bore wells reported by Shaji et al. (2007) from the eastern part of the Palakkad district. The country rock, hornblende biotite gneiss, was identified by them as the source of this high fluoride for both open wells and bore wells. Alkaline water depleted in calcium, low rainfall (average annual rainfall of 1200 mm), longer residence time of water in the aquifer zone and intensive irrigation were the favourable factors for the dissolution of fluorine-bearing minerals in groundwater of the eastern part of Palakkad district (Shaji et al. 2007). Even though a major portion of Thuthapuzha Sub-basin is underlain by hornblende biotite gneiss, the high rainfall (average annual rainfall of 3080 mm) and acidic water enriched in calcium may be the factors limiting the leaching of fluoride-bearing minerals in this region. The F concentration of the river water during the pre-monsoon season ranged from BDL to 0.70 mg/L. Except two river water samples during the monsoon season and one sample during the post-monsoon season, the F concentration of all other river water samples was found to be BDL. The results show that the F concentration of 100% of open well samples irrespective of seasons and river water samples during both monsoon and post-monsoon seasons, respectively, was less than 0.60 mg/L. The F concentration of 89% of river water samples during the pre-monsoon season was also less than 0.60 mg/L. Very low doses of fluoride (< 0.60 mg/L) in the water of the study area may promote dental caries unless F is supplemented from other source of food. Phosphorous is a component of complex synthetic fertilizers widely applied in agriculture (FAO 1996). Even though the study area is dominated by agricultural activities, the PO4 concentration of the entire open well samples during the pre-monsoon and monsoon seasons was below the detectable limit. 91% of the open well samples during the post-monsoon season were also below the detectable limit. The PO4 concentration of the river water samples was below the detectable limit irrespective of seasons. Silica dissolved in natural waters has been considered as a good indicator of weathering and water circulation conditions (Dobrzynski 2005). The SiO2 concentration of the open well samples ranged from 5.95 to 41.25 mg/L during the pre-monsoon, 1.20 mg/L to 42.00 mg/L during the monsoon and 1.50 mg/L to 45.80 mg/L during the post-monsoon season. The seasonal average of SiO2 concentration was 16.75 mg/L, 12.89 mg/L and 14.69 mg/L during the pre-monsoon, monsoon and post-monsoon seasons. The SiO2 concentration of the river water ranged from 6.66 to 17.66 mg/L during the pre-monsoon, BDL to 6.30 mg/L during the monsoon and 0.80 mg/L to 13.20 mg/L during the post-monsoon season. The river water samples also exhibited an increase in silica content downstream of the river course. According to Gao et al. (2010), an increase in silica concentration along the river course indicates an increased input of groundwater. The increase in silica content towards the downstream of Thuthapuzha River may be due to groundwater contribution. pH with HCO3 during all the three seasons and with Mg and Ca during the monsoon season. Na with Cl in all the three seasons and with K during the monsoon season. Mg with Ca and HCO3 in all the three seasons. Ca with HCO3 in all the three seasons. Cl with K and SO4 during pre-monsoon season. K with Ca, SO4 and HCO3 during the pre-monsoon season and with Na, Cl and SO4 during the monsoon season. SO4 with HCO3 during the monsoon season. The positive correlation among pH, Ca, Mg and HCO3 ions may be attributed to the weathering of common calcium-bearing minerals like calcic plagioclase feldspars, pyroxenes and amphiboles present in silicate rocks of the study area. Correlation coefficient matrix of physico-chemical parameters of the river water samples during the pre-monsoon, monsoon and post-monsoon seasons is presented in Table 3. The following ions of the river water samples showed positive correlation. Na with Ca, Cl and K during the pre-monsoon season; Ca and Mg during the monsoon season. Na with Mg and HCO3 during the post-monsoon season. Mg with Ca, Cl, K and SO4 during the pre-monsoon season and with HCO3 during the monsoon season. Ca with Cl, K and SO4 during the pre-monsoon season and with HCO3 during the post-monsoon season. Cl with K and SO4 during the pre-monsoon season. Piper diagram (Piper 1944) was employed to express the similarity and the dissimilarity in the chemistry of water samples based on the dominant cations and anions. Based on the Piper diagram, the open well samples of the study area during the pre-monsoon season (Fig. 2) belonged to three water types. During the monsoon and post-monsoon seasons, four water types (Fig. 2) were recognized for the open well samples. Alkaline earths and weak acids (CaMgHCO3 type) dominated in 46%, 45% and 54% and alkalies and strong acids (NaCl type) dominated in 23%, 27% and 23% of the open well samples during the pre-monsoon, monsoon and post-monsoon seasons, respectively. 31% of open well samples during the pre-monsoon, 18% during the monsoon and 3% during the post-monsoon season belonged to mixed Ca–Mg–Cl type and 10% and 20% of samples during the monsoon and post-monsoon seasons, respectively, belonged to mixed CaNaHCO3 type. The river water samples of the study area belonged to two water types irrespective of seasons (Fig. 2). The river water samples were dominated by alkaline earths and weak acids (56%, 60% and 89% during the pre-monsoon, monsoon and post-monsoon seasons, respectively). 44% of river water samples during the pre-monsoon, 40% during the monsoon and 11% during the post-monsoon season belonged to mixed CaMgCl type. The chemical weathering of rocks and minerals present in the basin, atmospheric precipitation and evaporation–crystallization process are the three major mechanisms controlling the major ion chemistry of both surface water and groundwater (Clarke 1924; Gibbs 1970). In the present study, Gibbs diagram (Gibbs 1970) was employed to understand and to differentiate the influences of rock–water interaction, evaporation and precipitation on shallow groundwater and river water chemistry of pre-monsoon, monsoon and post-monsoon seasons. Gibbs diagram illustrates that both the open well and the river water samples fall within the water–rock interaction field irrespective of seasons (Fig. 3a, b), indicating that the weathering of rocks primarily controls the major ion chemistry of water in this region. The quality of water plays an important role in irrigated agriculture. The suitability of water for irrigation is contingent upon the effects of mineral constituents of water on both plant and the soil (Hill 1942; Anon 1946). The most important characteristics which determine the suitability of water for irrigation are salinity, sodium percentage, sodium adsorption ratio (SAR), residual sodium carbonate (RSC) and permeability index. Salinity is broadly related to total dissolved solids (TDS) and electrical conductivity (EC). High concentrations of TDS and electrical conductivity in irrigation water may increase the soil salinity. The salts in the water affect the growth of plants directly and also affect the soil structure, permeability and aeration, which indirectly affect plant growth (Todd 1959). Water with electrical conductivity less than 250 μS/cm is considered as excellent, between 250 and 750 μS/cm as good, 750–2250 μS/cm as medium, 2250–4000 μS/cm as bad and greater than 4000 μS/cm as very bad for irrigation. The electrical conductivity of 86% of the open well samples during both pre-monsoon and post-monsoon seasons and 84% of the open well samples during the monsoon season was ‘excellent’. 14% of open well samples during both pre-monsoon and post-monsoon seasons and 16% of open well samples during the monsoon season were ‘good’ for irrigation. Sodium concentration is important in classifying irrigation water because sodium reacts with the soil to reduce its permeability. Sodium content of water is expressed in terms of sodium percentage (Na%) (Wilcox 1955). where all ionic concentrations are expressed in milliequivalents per litre (epm). Based on the Na%, Wilcox (1955) classified the irrigation waters into excellent (< 20 Na%), ‘good’ (20–40 Na%), ‘permissible’ (40–60 Na%), ‘doubtful’ (60–80 Na%) and ‘unsuitable’ (Na% > than 80%). The Na% of open well samples ranged from 13 to 67% during the pre-monsoon, 18% to 79% during the monsoon and 20% to 74% during the post-monsoon season. For the river water samples, the Na% varied from 23 to 39%, 28 to 39% and 20 to 38% during the pre-monsoon, monsoon and post-monsoon seasons, respectively. Nine per cent of open well samples during the pre-monsoon season and 3% during the monsoon season were excellent for irrigation. 57%, 37% and 34% were good during the pre-monsoon, monsoon and post-monsoon seasons, respectively. 34% of open well samples during all the three seasons were permissible, and 26% and 32% of open well samples during the monsoon and post-monsoon seasons were doubtful for irrigation. The entire river water samples during the pre-monsoon, monsoon season were good for irrigation. where the concentrations are expressed in meq/L. According to this classification, the water samples with SAR values less than 10 are considered as excellent, 10–18 as good, 18–26 as doubtful and > 26 as unsuitable for irrigation. The SAR values of the entire open well and river water samples of the study area were found to be less than 10 irrespective of seasons. Hence, based on the SAR values, all the open well samples and river water samples were ‘excellent’ for irrigation. The classification of water for irrigation was also represented graphically by plotting the values of specific conductance and SAR on the USSL diagram. 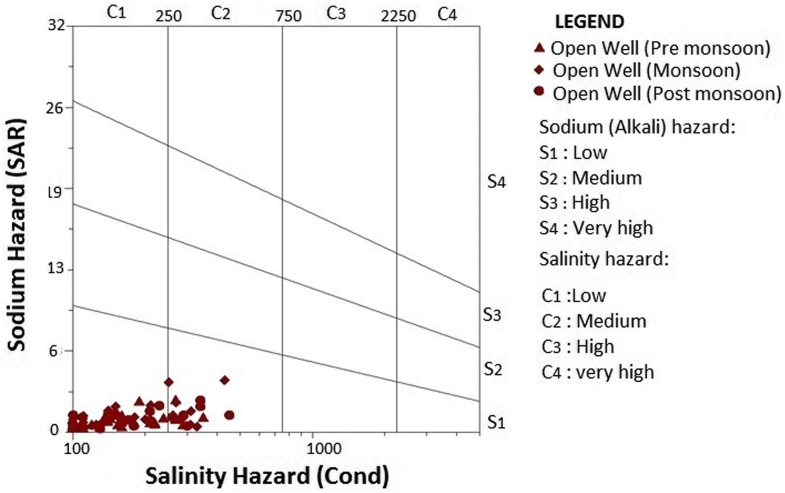 The sixteen classes in the diagram indicated the extent that the water can affect the soil in terms of salinity hazard and sodium hazard. Open well samples of the study area when plotted on the USSL diagram fell in the C1S1 and C2S1 field, indicating low salinity hazard and low to medium sodium hazard for the pre-monsoon, monsoon and post-monsoon seasons (Fig. 4). Concentration is expressed in meq/L. Water containing excess of carbonate and bicarbonate tends to precipitate calcium and magnesium present in the soil as their carbonates. As a consequence, the relative proportion of sodium increases and gets fixed in the soil, thereby decreasing the soil permeability. A negative RSC indicates that sodium build-up is unlikely since sufficient calcium and magnesium are in excess of what can be precipitated as carbonates. Positive RSC indicates that sodium build-up in the soil is possible. If the RSC exceeds 2.5 meq/L, the water is unsuitable for irrigation, if RSC is between 1.25 and 2.5 meq/L, then the water is of marginal quality, and if RSC is < 1.25, then the water is suitable for irrigation (Lloyd and Heathcote 1985). The RSC values of 100% of the open well and river water samples during the pre-monsoon, monsoon and post-monsoon seasons, respectively, were less than 1.25 meq/L, and hence, these waters were suitable for irrigation. The soil permeability is affected by the long-term use of irrigation water as it is influenced by Na+, Ca2+, Mg2+ and HCO3− content of the soil. Doneen (1964) evolved a criterion for assessing the suitability of groundwater for irrigation based on the permeability index (PI), where concentrations are in meq/L. Accordingly, the PI is classified as class I (> 75%), class II (25–75%) and class III (< 25%). Class I waters are categorized as excellent, and class II waters are categorized as good for irrigation. Class III waters are unsuitable with 25% of maximum permeability. The PI values of 51%, 91% and 74% of the open well samples were excellent, and 49%, 9% and 26% of the open well samples during the pre-monsoon and post-monsoon seasons, respectively, were good for irrigation. 22% and 89% of river water samples were excellent, and 78% and 11% of river water samples were good during the pre-monsoon and post-monsoon seasons, respectively. The entire river water samples during the monsoon season were excellent for irrigation. MH values > 50 are considered harmful and unsuitable for irrigation purposes. Magnesium hazard values of the open well samples ranged from 16 to 46 meq/L, 24 to 49 meq/L and 22 to 45 meq/L during the pre-monsoon, monsoon and post-monsoon seasons, respectively. For the river water samples, the magnesium hazard values varied from 27 to 47 meq/L during the pre-monsoon and 11 meq/L to 49 meq/L during both the monsoon and post-monsoon seasons. Based on the magnesium hazard values, the entire open well and river water samples were suitable for irrigation. Physico-chemical parameters of open well and river water samples of Thuthapuzha Sub-basin of Bharathapuzha were determined to evaluate the suitability of water for drinking and irrigation purposes. The chemical properties of the river water samples were dominated by alkaline earths and weak acids (CaHCO3 type). Even though majority of the open well samples belonged to CaHCO3 type, few samples belonged to NaCl, mixed CaMgCl and mixed CaNaHCO3 water type. 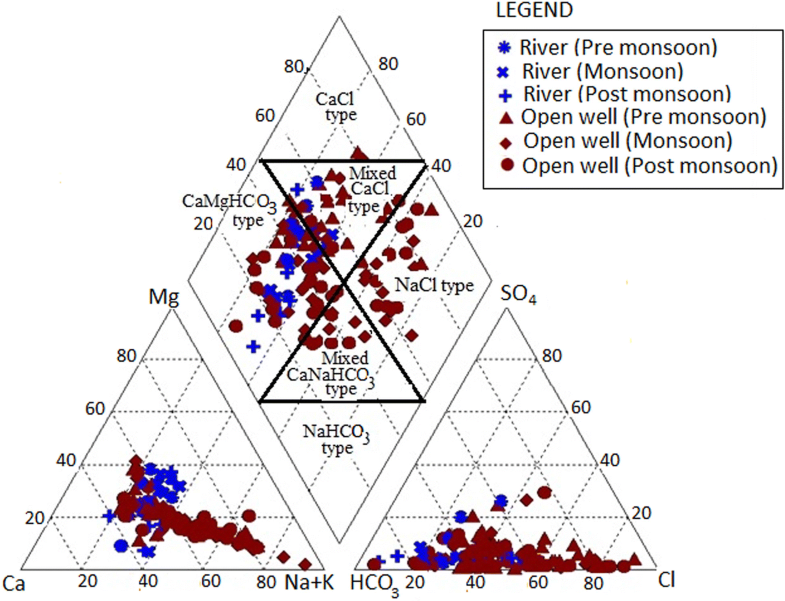 The groundwater and river water chemistry of the region was influenced by the chemistry of the host rock rather than precipitation and evaporation. 80%, 66% and 83% of the open well samples during pre-monsoon, monsoon and post-monsoon seasons, respectively, were acidic with pH value below the prescribed limit for drinking purposes. The low pH of the open well samples can be due to the laterites and the lateritic soil since laterites have the capacity to generate acidity and consume majority of all dissolved oxygen in the water that infiltrates into the earth system. The total iron concentration of 3%, 6% and 9% of the open well samples during the pre-monsoon, monsoon and post-monsoon seasons, respectively, was below the acceptable limit for drinking purpose. Except pH and the total iron concentration, all other physico-chemical parameters of the open well samples of the study area were within the acceptable limit of drinking purposes. The physico-chemical parameters of the entire river water samples were within the acceptable limit for drinking purpose. The entire open well and river water samples were suitable for irrigation purposes. The study forms part of the fist author’s doctoral programme at Kannur University. The work also forms part of the Centre for Water Resources Development and Management Plan-funded project ‘Hydrochemical and Isotopic Characterization of Thuthapuzha Sub Basin of Bharathapuzha’. Dr. Resmi, T.R., is acknowledged for all the help and support provided for this study. Ms. Surya, Ms. Abhisha and Ms. Haritha are acknowledged for analytical support. The authors are thankful to the Executive Director, Centre for Water Resources Development and Management, Kozhikode, for permission to publish the manuscript.